Note: The attempt here is to impart an abstract understanding of the basic rules of electricity. The explanations written here are not what your physics teacher would use to teach this subject in a formal setting. The goal is to explain these relationships in a way that will make the terminology, and the relationships between these terms, understood by the average person. For those who take the time to study this material, the information will be very helpful. Power is work, and is expressed in watts. A 100 watt light bulb requires 100 watts of energy in order for it to work. Notice that I didn't say you would get 100 watts of light. The power used by the bulb is 100 watts, a small part of which is radiated as light. The rest is given off as heat. The volt is a unit of Electro-Motive Force, or EMF. Electrons with higher voltage carry more power. That's why an amp of current at 12 volts carries 1/2 the power than an amp of current at 24 volts. Big utilities use thousands of volts for transmission lines so that the current used to transmit millions of watts of power can be kept small. Lower voltages mean larger wire needs to be used. Look at the wire charts below and you will see the relationship. Amps, or amperes, is related to volume. In fact the definition of an ampere is based on the number of electrons (1 coulomb) that pass through a wire in 1 second. P = I * E where P=power in watts I=current in amperes and E=Volts. 24V at 5 amperes of current. All three of these sets of values result in 120 watts of power. With a little algebra we can restate this formula in two other ways, which can be very useful. If I need to know how much current will be drawn by a load of 120 watts, and I know the voltage is 12 volts, I divide 120/12 and I see that I will need 10 amperes of current. R is resistance in ohms. In the context of solar power it may seem that resistance is an evil thing, but without resistors and other devices that allow engineers to harness and control current flow, modern life would be nearly impossible. Battery monitoring requires the use of a shunt (a carefully calibrated resistor) to sense current direction and amplitude. However, when wiring for solar power at low voltages, resistance is something you need to be concious of. Eliminate unnecessary junctions, use large wire, and think about how to shorten wire lengths. The siting and sizing of a wind power system can be a challenge, but here are a few hints that might help you in sorting out these important details. Wind isn't constant, and average wind speeds don't tell you enough about wind characteristics at your intended installation site to predict the amount of power you will harvest. The reasons are worth understanding, and a little technical insight may be of benefit to you. The ability of any wind generator to produce power in a given wind, is directly proportional to the swept diameter of the blades. 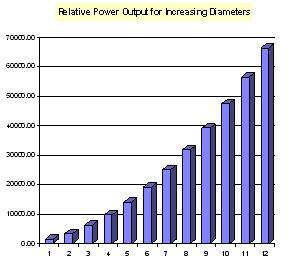 As the following chart implies, the power output goes up rapidly with blade diameter! As you study wind power equipment specifications be sure to note the blade diameters of machines. The aerodynamic design limits of blades designed for wind generators are clearly known and understood. So you need to be on the lookout for systems that claim much higher power output for the same (or smaller) diameter blades. The number of blades used are not a key issue here. Although 3 bladed systems run more quietly the output power varies very little. The swept area is a key specification. Six feet diameter systems capture less than 1/3 the power of twelve feet diameter systems. Remember that this chart is just to illustrate the importance of blade diameter, and fails to take other losses into consideration. The mass of air drops with altitude, so remember to derate expected power from your system at higher altitude. You can expect 18% less power at 6000ft then you would expect at sea level. The power of wind increases with the cube of the wind speed. This means that even a small sounding difference in wind speed can make a large difference in the power harvested from the wind system. Average wind speed doesn't take into account the frequency and predictability of wind. Occasional bursts of high winds, or seasonal winds can skew the average. To explain this concept let's consider two wind power sites. One site has a constant 10 mph wind 24 hours a day, every day. The second site has no wind at all 12 hours a day, and 20 mph hour winds the other 12 hours. The average is precisely the same but the power distribution is vastly different. The second site will produce 8 times the power of the first site when the wind is blowing 20 mph, resulting in 4 times the power output of the first site, this in spite of the fact that NO power is being produced half of the time! Remember that both sites have exactly the same average wind speed. A general rule of thumb is that a wind machine should be raised at least 15 feet above all surrounding buildings and trees. This is because air passing around buildings and trees is very turbulent, and this turbulence diminishes the efficiency of the blade system on your wind machine. As you raise your system height, you usually get increased wind speeds as well. Even a small sounding increase in wind speed makes a big difference in power output. When planning a tower system to mount your wind machine, keep in mind that there are limits on how high you can go... In the U.S. if tower heights exceed 60' above surrounding buildings and trees, you may have to apply for a permit. There are also potential zoning problems, so ask the appropriate people before making a heavy investment in a tall tower. I know that if a tower exceeds 100ft, lighting may be required due to the potential risk to aviators. Rohn towers are very popular for typical wind power installations.. Due to low cost and ease of installation 25G is a popular size. Rohn 25G can be used for guyed towers over 100 ft in height for wind machines with rotors up to 10ft in diameter. Rohn 45G is stronger and should be used for machines with rotors up to 16ft in diameter. Two inch pipe can be used for small wind system with rotors up to 5ft in diameter, at heights up to 30ft. Remember NOT to mount a wind machine to the side of a building. The noise and vibration can be a real problem! In a direct strike your system is toast! But there are steps you can take to reduce the risk of a high voltage charge building up on your tower. This is accomplished through the liberal installation of ground rods around the base of the tower. Wire strapped to the tower for a good connection should be straight without any kinks. Lightning likes a straight path to ground. Purposely put a right angle in power lines coming down from the tower immediately above a ground rod. This will create an easy path for the lightning to go straight to ground. Damage caused by the near miss of a lightning strike can be avoided or minimized by using commercial surge suppressors designed for protecting your solar power system. There will be more on this later in our catalog. These steps outlined here may not prevent damage, but they can help. Fortunately wind systems in highly active lightning areas spend their entire working lives without getting hit, but Murphy's law dictates that you can't count on that. Romance can be expensive, so be careful. Some things are best left in the past. Some companies specialize in rebuilding older wind machines, but you may want to check with an expert before you make a purchase. The year it was built can be as important as the make and model. Very few home builts actually work reliably, and even fewer produce power at efficiencies that are comparable with commercial units. Individuals don't have the money or experience to bring to bear to design a system and build it properly. Building a series of prototypes until a design is perfected just isn't worth it unless you are going to market with your design. It's a fun thing to do after you have a good system in place and you want to experiment, but not an alternative to a commercial design from a long time wind power manufacturer. Low voltage DC implies high currents, which place a heavy burden on wire size and low resistance connections. Knowing this, you might be tempted to use 4/0 size wire everywhere, but when you see the price of 4/0 copper wire, you'll see that buying unnecessarily large wire is an expensive proposition. The following wire charts will help you see the relationship to distance, current, and wire size for a given loss. Pay strict attention to the quality of all connections. Where possible, eliminate unnecessary connections. Keep wire lengths short.